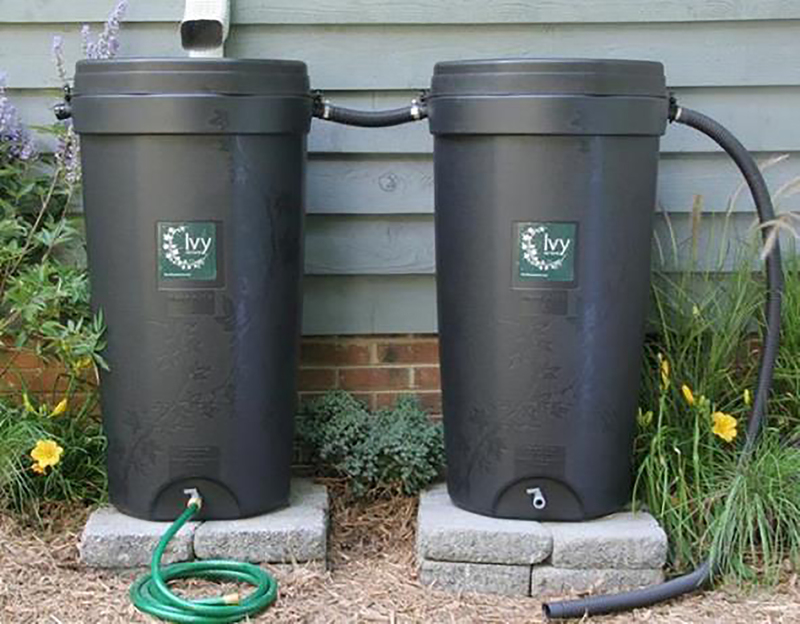 These rain barrels, available from the County, can collect rainwater for future use on your lawn or garden. A big storm is approaching and through February 10, County residents can still get a discounted, top-of-the-line, $90 Ivy rain barrel to be ready to “harvest” the next rains, cut watering costs and protect beaches, thanks to San Diego County’s Watershed Protection Program and the nonprofit Solana Center. In addition, that $90 cost could shrink even more—to as little as $25—for residents who meet the requirements for rebates and discounts from the County and the Metropolitan Water District of Southern California. San Diego County residents can order a rain barrel online for $90 at the Solana Center’s website through February 10. County residents who get their water from the Metropolitan Water District of Southern California—through the San Diego County Water Authority or its participating member agencies—can apply for a $35 rebate that can shrink the cost of their rain barrel to $55. Meanwhile, the County of San Diego is giving out its own $30 discount to residents living in unincorporated areas—on the first 200 rain barrels ordered. Qualify for the Metropolitan rebate and the County discount, and your rain barrel is just $25! The rain barrels will not be shipped. Instead, you can pick up your barrel from 9 a.m. to noon, Saturday, Feb. 16 at the Rincon Water District, located in Escondido at 1920 N. Iris Lane, or from 9 a.m. to noon Saturdays at the Solana Center’s offices in Encinitas. Having a rain barrel can let you “harvest” rain right off your roof and use it to keep your gardens or lawns green the old-fashioned way. That can cut your water costs and even help protect our local beaches by preventing excess rain from washing pollution off our roofs and yards, and down our streets to the ocean. The Ivy rain barrels have a locking, child-proof lid, are made of 100 percent recycled material, have overflow ports, protective screening to keep mosquitoes out, a ¾-inch ball valve to connect to your garden hose or to another barrel, and they don’t need pumps because they use gravity to dispense their collected rainwater. Getting your discounted rain barrel is as easy as one, two, three. One, order your barrel. Two, apply for your rebate(s). Three, go pick up your barrel. Go to the County/Solana Center website. Scroll halfway down the page and choose one of the two locations to pick up your rain barrel — at the Rincon Water District in Escondido, or the Solana Center in Encinitas. Once you choose a location, you can order and pay for your rain barrel with a credit card. If you live in an unincorporated community or area and NOT in a city, remember to check the “unincorporated” box to make sure you are given the County’s $30 discount. The discount will be automatically applied to your purchase price when you’re buying your rain barrel. Solana Center officials will double-check after your purchase to make sure you’re eligible for the discount. You can check here to see a list of eligible, ineligible and maybe eligible ZIP codes. You may buy as many rain barrels as you’d like, but the Metropolitan rebate and County discount are limited to two per household. Finally, remember that your rain barrel will NOT be delivered. You can pick it up at either of the two pickup locations. $35 rebates from the Metropolitan Water District are available within 90 days of ordering/buying your rain barrel, so go to the SoCalWaterSmart link as soon as you order your rain barrel(s) and click on the rain barrel icon under “available rebates.” Rebates are available on a first-come, first-served basis. You can check out the Metropolitan Water District rebates’ frequently asked questions and conditions for help. Pick up your rain barrel! When you buy your barrel(s), Rain Water Solutions will email you a confirmation of your purchase (look for the email with the subject line “Order#… confirmed”). Remember to bring your confirmation email with you when you go to your chosen location to pick up your barrel. And remember to leave room in your car! Solana Center officials say that barrels fit easily in any four-door sedan or SUV and even into some two-door cars. The Escondido pickup for rain barrels will be between 9 a.m. and noon, Saturday, Feb. 16, at the Rincon Water District at 1920 N. Iris Lane. Pickups at the Solana Center in Encinitas will be between 9 a.m. and noon on Saturdays at the center, located at 137 N. El Camino Real. It’s easy. Now you can start harvesting the rain and saving our beaches.